Senate Finance Committee Chairman Mike Mazzei said Monday that Oklahoma’s “financial management options” should include suspension of the 0.25 percent reduction in the state income-tax rate that went into effect Jan. 1. “Given the financial stress the state faces, we should consider a number of financial management options, one of which is a delay in the reduction from 5.25 to 5 percent in the top tax rate,” said Mazzei, R-Tulsa. Mazzei last week filed Senate Bill 1073, which voids the reduction approved by the state Equalization Board in December 2014 and specifies such a reduction cannot occur in a fiscal year in which a revenue failure has been declared. SB 1073 also raises the requirements for triggering a rate cut from 5 percent to 4.85 percent. As those of us who agree with Mazzei keep saying, the tax cut is irresponsible at this time. I’ve heard personally from other legislators who get it. Critics argue the money left in citizens’ hands through tax cuts would be better spent on government. They say increased funding for things such as schools, roads and social services makes a state more attractive to businesses than a low tax rate. If so, Connecticut should be booming. Instead, since 2010 Connecticut has experienced almost no growth in state gross domestic product. No doubt, some proponents of higher tax rates will note GE is relocating to Boston. So the company is exiting one high-tax state for another nationally lampooned as “Taxachusetts.” Yet the Tax Foundation ranks Massachusetts’ business climate 25th best in the nation, while Connecticut’s was 44th. In comparison, Oklahoma ranked 33rd. Clearly, if it’s good for big business, it’s good for the state, right? Just ask all those homeowners in Edmond who are dealing with cracks in their walls. Or maybe ask the drinking water aficionados from Flint, Michigan. It serves the Oklahoman‘s narrative, though, to frame this as the left wanting to hijack your hard-earned income. Like a Geico commercial, that’s what they do. No one should argue that tax rates are the only factor in business location decisions. But it’s a fool’s errand to pretend they’re irrelevant. It’s true. They also consider the quality of the schools. Schools cost money. That requires some taxation. You can’t have it both ways. Meanwhile, the state Board of Equalization certified a preliminary general revenue projection for the coming budget year that is $900 million less than the year before. That’s roughly the equivalent of overall ticket sales so far for Star Wars: The Force Awakens. Unless creator George Lucas can spare some change, or the price of oil makes a meteoric climb, the new year isn’t going to feel very new. Rather, it threatens to be a rerun of 2015 with further downsizing of an already shriveling state government. Those who argue that is not the worst thing that could happen, should say that to the face of a public school student or teacher. Ranking at the bottom of the barrel in per-pupil spending for common education is never acceptable, no matter what the circumstances. On the promising side, Oklahoma has ridden the energy price roller coaster before and always rebounded eventually. The last line is my favorite. The editorial board is basically saying, We know we’ll see better days. We always have, right? That’s what I call forward thinking. Surely there’s a unicorn out there somewhere! Still, as usual, it’s better than what the Oklahoman editorial writers have given us this morning. In their 2016 wish list, they have two Thunder-related items, but just one for education: vouchers. Education Savings Accounts: Status-quo forces in education often claim Oklahoma students’ academic performance will never improve unless huge spending increases are provided. Yet if parents were given the ability to use their child’s per-pupil allotment, as would be the case with Education Savings Accounts, those officials may be shocked by how quickly improvement occurs. ESAs would allow parents to use a portion of the tax money already dedicated to their child’s education to spend on tutoring, online learning, or private school tuition. It’s time Oklahoma lawmakers provide beneficiaries the same flexibility with education funds that they are provided for other government programs, such as food stamps. One size does not fit all students, and it makes no sense to act as though children will receive a better education if they’re assigned a school based on geographic proximity to one’s house rather than based on a child’s individual needs and parental involvement. This is where that morning-after blurry-eyed effect hurts me. I’m going to have to go through this one sentence by sentence. Status-quo forces in education often claim Oklahoma students’ academic performance will never improve unless huge spending increases are provided. I’m glad to see they didn’t use the trite verbiage Education Establishment. Maybe that’s a sign of a resolution they’ve made. Actually, what those of us who teach students and lead districts illustrate is that huge cuts in state aid have hurt our ability to provide services for students. We point out that the state’s abdication of responsibility vis-à-vis funding public schools at a proper level has made providing teacher raises of any significance impossible. This, combined with mandates that create meaningless work for already over-tasked teachers, has driven quality people out of the profession. We’re not asking for huge spending increases; rather, we want a reversal of the huge funding cuts that we’ve seen since 2008. Let me just point out that for the 2013-14 school year (the most recent available data), Oklahoma districts received less than half of their funding (48.0%) from the state. The rest came from local and federal sources. This continues a 15 year trend that shows no sign of reversing. Year-by-year, the Legislature has been less committed to funding public education, and more committed to regulating it. Yet if parents were given the ability to use their child’s per-pupil allotment, as would be the case with Education Savings Accounts, those officials may be shocked by how quickly improvement occurs. Actually, we wouldn’t see any improvement, because the voucher pushers in the Legislature and the newspaper also insist that we shouldn’t hold private schools accountable in any way for student achievement. In other words, they want the money, but not the rules. As for schools, we just get the rules. ESAs would allow parents to use a portion of the tax money already dedicated to their child’s education to spend on tutoring, online learning, or private school tuition. The voucher bill currently on the table, SB 609, would provide benefits to a student who “previously was enrolled in the first one hundred (100) days of the prior school year in an Oklahoma public school district.” In other words, students currently enrolled in private schools wouldn’t have access to the voucher – for now. If 609 passes, expect to see a lot of school-flipping. Another important consideration is that private schools don’t have to accept everybody. And they shouldn’t have to accept everybody. They have a specific mission, which is why parents choose them. Our mission as a state – as a system of public schools – is to educate everybody who shows up. Given that charge, we do a damn good job, no matter what narrative serves the convenience of voucher proponents. Meeting all state and federal mandates. Otherwise, this isn’t a serious conversation. It’s time Oklahoma lawmakers provide beneficiaries the same flexibility with education funds that they are provided for other government programs, such as food stamps. I’m glad the Oklahoman supports flexibility for how people qualifying for public assistance, such as public school employees, spend their benefits. On the other hand, the paper also supports cuts to the food stamps program. To be clear, food stamps are a benefit for people living in poverty. Vouchers are a benefit for people in the middle class. Those are the students that private schools would accept. Those are the students whose families could make up the difference. A food stamp recipient can shop anywhere. The merchant will accept the business because it has cash value. A customer spending food stamps is a paying customer, in their eyes. A voucher recipient will not have these same choices. One size does not fit all students, and it makes no sense to act as though children will receive a better education if they’re assigned a school based on geographic proximity to one’s house rather than based on a child’s individual needs and parental involvement. I agree. That’s why thousands of parents have chosen to transfer their students across school district boundaries. It’s also why I oppose many of the mandates that this paper supports. We could provide more choices within our arguably-publicly funded schools right now, if the Legislature passed a few simple bills. Replace the EOIs with the ACT. Cut all tests not required by the feds. Take quantitative measurements out of teacher evaluations. Create an accountability system that focuses less on testing. We’re the educators. We would love to focus more on meeting each child’s individual needs. We don’t want to spend another minute preparing our most profoundly disabled students for state tests or the portfolios that serve as their proxy. We don’t want to spend another minute slowing down our gifted kids in classes that continue to get bigger while we prepare the masses for poorly-developed state tests. The upcoming legislative session is critical. I can think of at least three term-limited legislators who would love nothing more than to pass a voucher bill. Doing so would serve as their springboard into some of the statewide races that will be up for grabs in 2018. Every vote for SB 609 – or anything resembling it – is a vote against public schools. For the third installment in my long and labored farewell to our departing state superintendent, I want to focus a little more on the mindset she has brought to office, rather than on Janet Barresi herself. This week, Education Week released Quality Counts – a grading scale for education in each state – for 2015. The good thing about this scale is that Education Week uses – yes, you guessed it – LETTER GRADES! Oklahoma received a D+, good enough to beat three other states: New Mexico, Nevada, and Mississippi. As always, thank God for Mississippi! What’s not remarkable at this point is how each of the state’s largest papers treated the news. Both the World and the Oklahoman took up major space with articles on the rankings. Both papers also included caustic remarks from Barresi. “There are serious flaws in our system — flaws that begin in the failure to adequately prepare teachers for the classroom and continue when we tell ourselves that our only problem is with children in poverty. Indeed, with abysmal results like this, the problem is with academic achievement of each child in our state,” Barresi said in the statement. “The longer we as a state ignore the reforms needed to turn around our schools, the longer it is we sentence our young people to a mediocre education,” she said. “To put this report in context, it’s important to remember that the National Council on Teacher Quality recently found serious deficiencies with teacher preparation in Oklahoma,” Barresi said in a statement. “There are serious flaws in our system — flaws that begin in the failure to adequately prepare teachers for the classroom and continue when we tell ourselves that our only problem is with children in poverty. The percentage of Oklahoma students rated “proficient” or better on National Assessment of Educational Progress (NAEP) tests for reading and math in the fourth and eight grades is below the national average, according to the report. Additionally, the report found just 13.6 out of every 100 Oklahoma students taking advanced placement tests achieve a high score — about half the national average of 25.7 students. First, let me remind Barresi that only members of the education establishment liberal union status quo are supposed to challenge a report card’s methodology. Second, I find it especially telling that she continues to peck away at teacher quality after writing for both papers this week about how hard they work. It is especially notable that she cites the NCTQ, which gets most of its funding from the likes of Bill Gates and Eli Broad – you know, the people hell-bent on the narrative that public schools are failing. 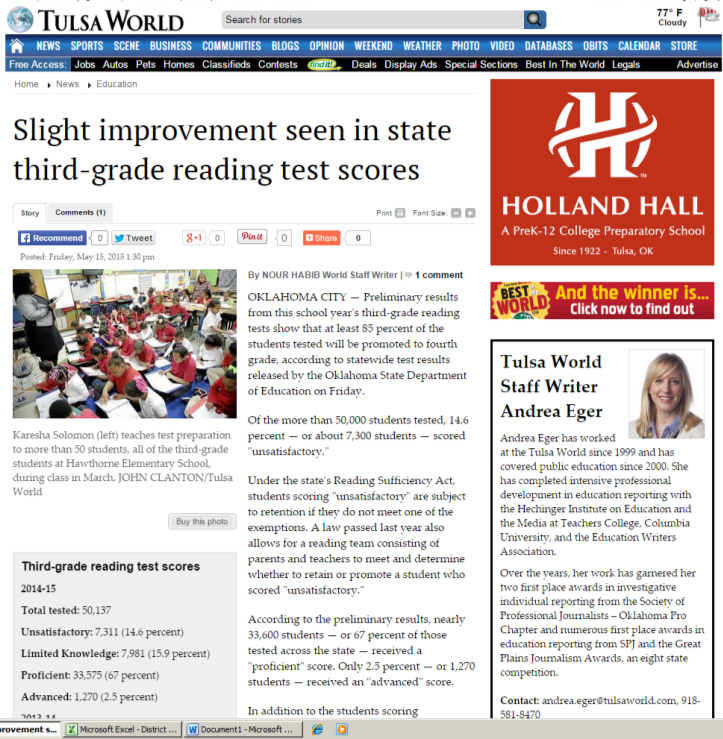 Unlike the Oklahoman, Andrea Eger and the World broke down the components of Oklahoma’s overall grade. Basically, Oklahoma’s grade takes a major hit from spending. We spend equitably, though. I guess that means we are fair about how badly we fund schools. It doesn’t matter if you’re rich or poor, urban or rural, big or small – we keep you on the same scraps. No, unlike the World, which put more facts into the story, the Oklahoman thought they should put more editorial and snark into it. DEFENDERS of the status quo often blame Oklahoma’s low education rankings on poverty. Certainly that plays a role. Yet the new edition of Education Week’s Quality Counts report suggests that Oklahoma students at all income levels are falling short. Quality Counts ranks states based on a student’s chance for success, school finances and K-12 achievement. The report gives Oklahoma an overall grade of D-plus and ranks it 48th in the nation. In the area of K-12 achievement, Oklahoma was given a D.
What Janet Barresi and the editorialists at our state’s largest paper failed to realize is that Oklahoma’s grade on the Education Week scale has fallen during the last four years. Fortunately, not everybody missed it. Perhaps, now that she has some spare time, Barresi should learn to research, so that later she might research to learn. In 2010, Oklahoma’s grade on this index was 76.4, a C. We were above the national average. If letter grades matter (they don’t) and we should take rankings such as these seriously (we shouldn’t), then why isn’t Barresi owning the fact that she presided over our state’s precipitous fall. Her supporters – few as they are at this point – can’t point to defenders of the status quo on this one. Barresi entered office four years ago with a legislature and governor of the same party. They even re-wrote laws to allow Governor Fallin to relieve the entire State Board of Education of their duties and appoint new members who ostensibly would clear a path for the Reformer-in-Chief. To whatever extent the state has rejected Barresi and even slipped during her tenure, assigning blame to teachers and administrators is disingenuous. No, she failed as state superintendent because she never honestly engaged the people who work with children and tried to understand their perspective. She failed because she antagonized people who opposed her. She created an echo chamber in which nobody dared question her. Those who fought her Nehemiah-esque battles, Barresi cleared out competent people and arranged promotions – up to and including her last day in office. That’s where Part IV will pick up later this evening. Consider a recent Owasso forum focused on education. At that event, some attendees complained about a new law requiring retention of third-grade students who read at only a first-grade level or lower, based on state tests. The fact that children should be taught to read should be obvious, yet the law still has detractors. Think about that: The justification given for changing a major state law is that a single child out of roughly 50,000 third-grade students in Oklahoma once vomited during testing. The law of averages suggests this scenario happens at schools every day across Oklahoma, regardless of whether testing is ongoing. That child could have simply been sick, or other factors may have induced stress. Yet that isolated instance is pointed to as justification for watering down efforts to teach children to read. To politicians, anecdotes are the gold standard. Without them, we wouldn’t have the Merry Christmas Bill, the Pop Tart Gun Bill, or so many more of the fabulous entries into our state’s legislative record. Just think back to any presidential debate from the past 20 years. Every candidate has cherry-picked someone’s tale of woe and made it the symbol of what’s wrong with this country. In this case, however, I’m siding with the politician. I have seen the increase in anxiety. I have seen the students crying after their benchmark tests. I have seen teachers whipped into a frenzy over the fear that in spite all their efforts, a student will have a bad test day and they won’t have the documentation to promote the child anyway. Selective story-telling isn’t limited to politicians, by the way. 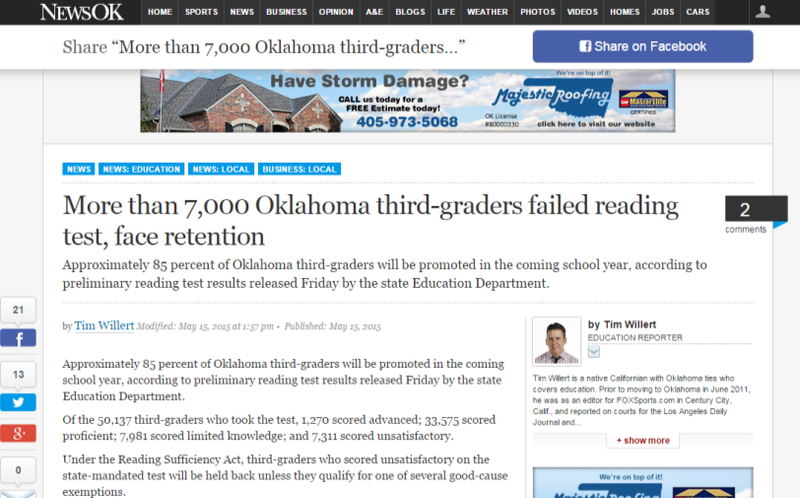 The editorialists at the Oklahoman missed the big ideas from the parent meeting. Fortunately, the journalists at the Tulsa World were on hand to do something resembling reporting. Several people also spoke about their opposition to the third-grade reading law, which this year requires third-graders to show proficiency on their reading test or be retained in the third grade. Robison told parents that there are six ways a third-grader could be promoted to fourth grade after failing the reading test. But one parent told him that has backfired in her daughter’s third-grade class. “What’s happening, sir, is they are taking instruction time from our children to build a portfolio on every single child just in case they don’t pass,” she said. After a pause, Robison said, “That’s unfortunate,” bringing a chorus of groans from the audience. 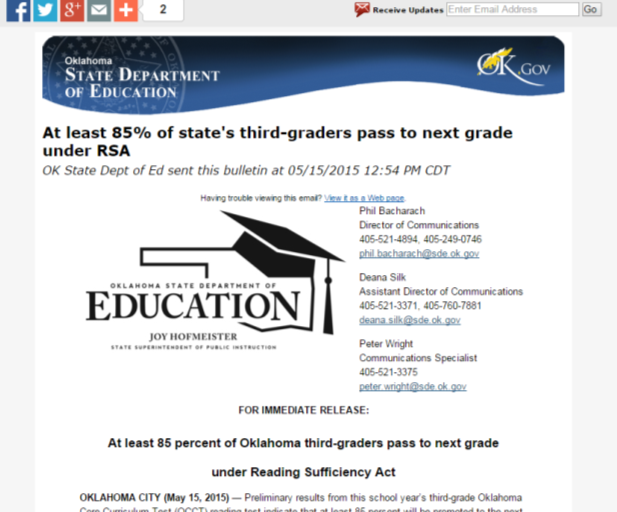 Rep. Jeannie McDaniel, D-Tulsa, said she has heard that as many as 4,000 third-graders could be retained this year. Robison said state officials estimate that about 12 percent of the state’s third-graders would be in danger of retention. She said she has introduced a bill that allows for a team of parents, teachers and principals to decide after remediation whether a child should be promoted to the fourth grade. The story, when told in full, is much more interesting. The key word here is parents. It’s not just teachers and administrators who hate the mandatory retention law; it’s parents too. Even ones who should have no concerns about how this will impact their children are unnerved. The Oklahoman believes parents should hold the schools accountable for wasting the time of all students by doing the portfolios (which of course are one of the good cause exemptions – and something REAC3H coaches are training districts to complete under the watch of the SDE). On a greater level, what parents should really demand is that we quit wasting such an insane amount of time on high-stakes testing. And by time, I also mean tens of millions of dollars a year. During a Q&A with KFOR in Oklahoma City yesterday (questions = softballs & answers = blame teachers), Superintendent Barresi did everything the Oklahoman editorial decries. She discussed her sons’ struggles with reading (anecdotal evidence). And she blamed all of the adults for creating the anxiety being felt by Oklahoma’s students. To that end, I’d agree with her. I just think she’s blaming the wrong adults. Fortunately, some of the grown ups in Oklahoma City have been listening to parents. Yesterday, the House Education Committee advanced two bills that would provide more options to parents of third graders in lieu of retention. The only two who voted no on each bill were Sally Kern and Jason Nelson. I’ll let that fact speak for itself. Barresi declined to be interviewed for this story. Her spokeswoman at the Oklahoma State Department of Education said she is unhappy with the coverage she has received in the Tulsa World. “We appreciate the offer. I just don’t think we want to do that at this juncture,” said Sherry Fair. It’s no secret that much of the loudest criticism of Barresi has come from the Tulsa area. Nor is it a secret that her campaign staff has personal ties to the Oklahoman’s editorial staff. State Rep. Lee Denney, R-Cushing, works regularly with Barresi on budget requests for common education and was a co-author of legislation based on one of Barresi’s campaign platform issues – replacing old school accountability scores with annual report cards with an A-F letter grade for every school in the state. An intense fight over the method for calculating those grades dominated news headlines throughout the fall of 2012. Eventually, the bill’s co-authors, Denney and Sen. Clark Jolley, R-Edmond, got involved to legislate changes to those grade calculations. At a time when improvement in Oklahoma’s public schools is badly needed, educators have been disenfranchised, Denney said. Those last few words – because this is how she has led for three years ­– provide the best overview of Barresi. She promised to make the SDE a service agency rather than a regulatory one. However, during the last three years, she has been ramming new rules into public schools and bypassing legislative authority and the rule-making process to do so. Members of her own party who agree for the most part with her agenda have grown weary of her methods. The interesting part is that they’re not afraid to say so.